As many of you wlll know, I try to garden biodynamically. For someone spontaneous and somewhat haphazard in her approach to life as well as to gardening, following some simple rules has enormous benefits for me and our garden. For everything there is a season and for every garden job there is a time in the month when it is best to tackle it. So far, so simple. Four or five years ago I started gardening using biodynamic methods and whilst I don’t yet fertilise with biodynamic preparations I do sow, plant, prune and mulch using the cycles of the moon as a guide. When I first started some of my friends thought it was properly mad and my allotment neighbour, Weedol Williie told me in no uncertain terms it was mumbo jumbo. He laughed helplessly and made endless jokes at my expense. At harvest time he stopped laughing so much and told me I was lucky that my tomatoes had not succumbed to blight and wondered which chemicals I’d used to get rid of the aphids which had damaged his broad beans. Of course now that some well-known supermarkets have come forward to say that they use the same methods to decide when to invite critics to taste their wine ranges, it has become much more popular and acceptable. In my experience, plants which have been sown according to moon cycles have a better developed root system, stronger flavour, more vibrant flower colour and a longer shelf-life. What’s more – and this is difficult to explain – the garden itself feels more alive, somehow. If you do nothing else in 2019, get your hands dirty by growing a garden and do it aligned to the moon’s cycles. You won’t regret it, I promise you. 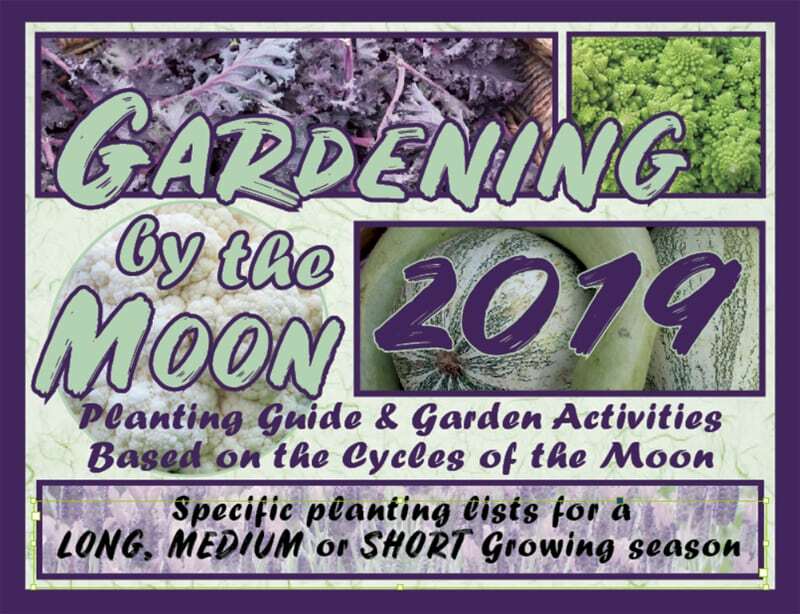 You can find moon planting guides and calendars online. Alternatively, buy Lia Leenderz’s almanac and the info is all there along with a myriad other great ideas for celebrating the seasons.